Cricket is a sport that generates a large volume of performance data and corresponding debate about the relative qualities of various players over their careers and in relation to their contemporaries. 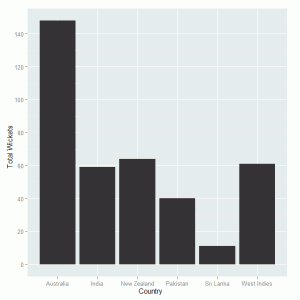 The cricinfo website has an extensive database of statistics for professional cricketers that can be searched to access the information in various formats. As an initial example we will consider the English legend Sir Ian Botham who played 102 test matches for England between his debut in 1977 until his final game in 1992. 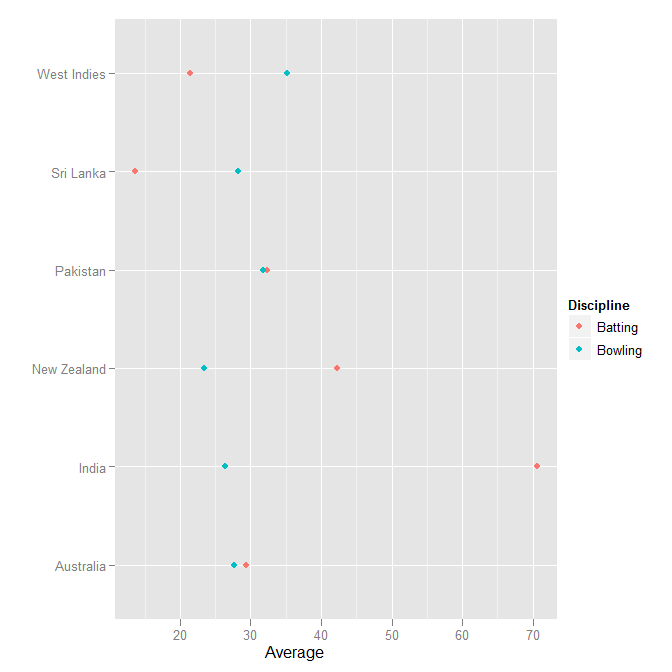 This can be converted into a dot plot so we can see whether Botham had a high batting average than bowling average, which is often taken to be one of the signs of an all-rounder. We can see the differences in performance based on the opposition. Botham’s performance against the West Indies, by far the strongest team during most of his international career, were worse than against the other countries. However, his averages were far from embarassing when compared to other players at the time. 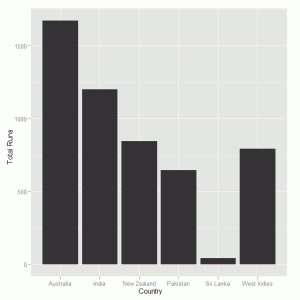 The graph also shows that Botham enjoyed batting and bowling against India. 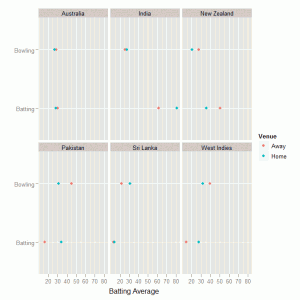 A dot plot is created from this data with a separate panel for each of the six opposition countries and the averages divided into batting and bowling performances. The coloured dots in the graph indicated whether the average is for matches at home or away. 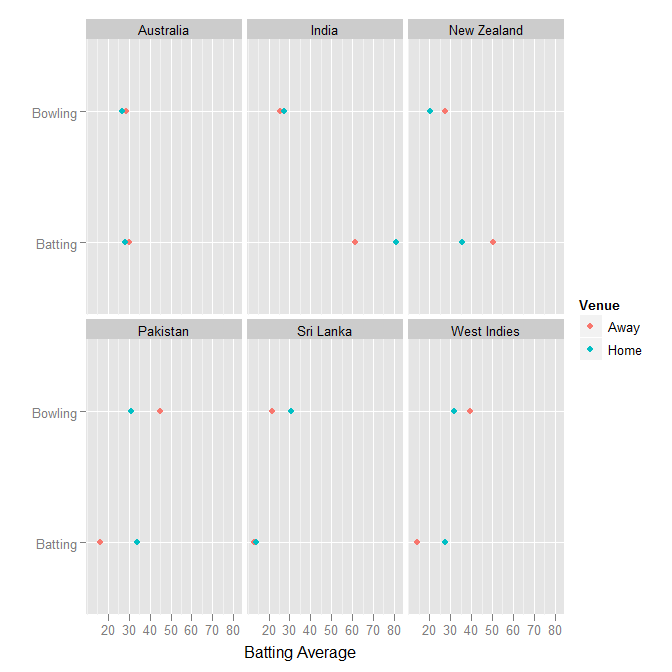 We can see that the difference between home and away peformance is, in general, not very large for bowling averages but in some cases there is a noticeable difference in batting averages. When looking at Botham’s performances against the West Indies his statistics at home are much better than his away performance, suggesting that his main struggles against the strong West Indies team were in the Caribbean. This might be due to his swing bowling being more suitable to English conditions compared to pitches in the West Indies. To round off this brief look at the career of IT Botham let us consider some other important statistics, in particular games where he performed with the bat and ball. Overall Botham scored 14 hundreds and 22 fifties out of 161 innings so he reached fifty runs every five innings or so. He also took 27 five wicket hauls and 17 four wicket hauls so he took four or more wickets every four innings or so. These performances and others show why Botham was considered such a great player as he produced some sustained periods of excellent all-round cricket rather than having one discipline more dominant for a long period of time. That is a difficult question, but I can safely say that he was much better than Derek Pringle!